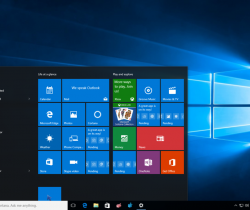 If you’re upgrading to Windows 10 on a desktop, then prepare to be delightfully surprised the Start menu is back. It’s probably the one of the best thing in windows 10. Microsoft has completely redesigned it in a way that combines the best aspects of the last two versions of Windows i.e. Windows 7 and Windows 8. For example as you might have seen in Windows 7, while booting Windows 10 you can also see a Start menu lives in the lower-lefthand corner. And, the Tiles which was introduced in Windows 8, can be seen inside the Start Menu. This will help the users to see all the tiles in a start menu instead of occupying whole screen of the monitor. Navigating around Windows 10 is also greatly improved. The pretty annoying hot corners are not include in Windows 10. Microsoft has introduced the virtual assistant into Windows 10 called as Cortana. It has been designed as an extension of the Start Menu. It also handles the local search, hitting the “My Stuff” button within Cortana search will search for files that are local to the machine and any data stored on OneDrive. Another new feature about Windows 10 is, it has been bundled with a new browser, called Edge. But, performance wise it does not fell that it is better than previous version of IE. Snapping tabs into new window is messy and clunky, and downloads start automatically with no choice of where they are being stored. Hopefully, these issues will be sorted out in future updates. But edge has some cool features such as you can draw all over webpages and send a copy to friends. It is very handy if you want to quickly share a screenshot of a site with some annotations.